Notre Dame tight end Brock Wright enters his junior year in a unique spot. The 6-foot-4, 250-pounder has played his freshman and sophomore year, but the time was spent primarily as a blocker in short yardage. Wright will enter this season with two catches for 12 yards and one touchdown, so he could also be considered inexperienced despite the role he played his first two seasons on campus. 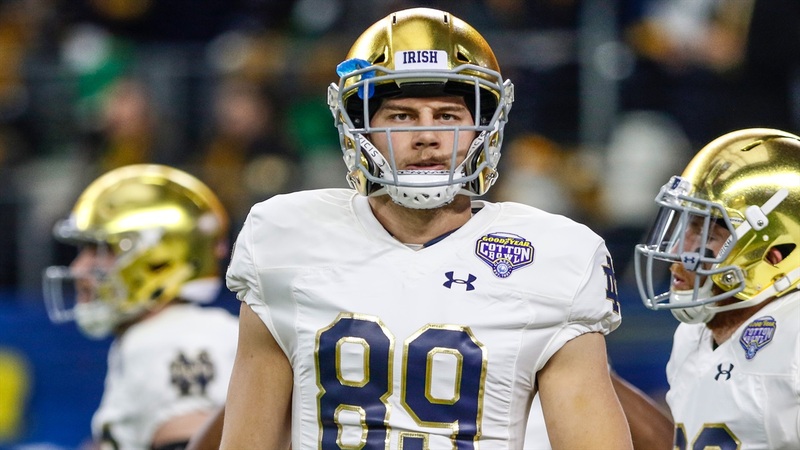 Wright and classmate Cole Kmet will look to lead the Irish tight end room in 2019 and it starts with mastering the finer details of the position. Long arrived at Notre Dame with Kmet and Wright as incoming freshmen. Both were ranked extremely high by recruiting services and Long has been able to push the right buttons to get the most out of each player this spring. Wright is a first-class kid and will follow the direction of any coach, but the fact Long played tight end in college allows the tight ends to trust Long’s guidance even more. While Wright is focused on improving as a player, this spring is also a significant opportunity for all the tight ends to build rapport with starting quarterback Ian Book. Alizè Mack is gone to the NFL, so the chemistry built over the spring with be vital to Wright and the Irish having another memorable season.